Find your perfect seaside oasis in the Rehoboth Beach Waterfront real estate listings below. Imagine waking up to ocean ambiance each morning with the smell of saltwater in the air and the sound of waves crashing on the beach or sloshing merrily against the boardwalk. This is the reality for homeowners who take advantage of the Rehoboth Beach oceanfront real estate market. Waterfront properties are a luxury that everyone wishes they could attain. Homes in Rehoboth Beach are no exception. Mostly comprised of large single family homes, properties in this area boast incredible views and airy design features inspired by beachside living. Luxurious amenities such as private docks, wine cellars, and hot tubs put Rehoboth Beach homes in high-demand for luxury homebuyers. Explore what’s new in Rehoboth Beach real estate listings or continue reading below to learn more about the great selection of waterfront homes for sale. An oceanfront property is the epitome of luxury living. This is especially true in Rehoboth Beach. Properties in this area combine light and beachy-inspired décor with high-end amenities and lots of luxury. Waterfront homes for sale in Rehoboth Beach are typically large single family homes of five bedrooms or more. These significant properties contain sweeping, open rooms with bright windows to let in spectacular ocean sunrises. Modern kitchens and spa-inspired bathrooms that would rival any five-star hotel are also common in these homes. The most luxurious of these properties are located on Ocean Drive. 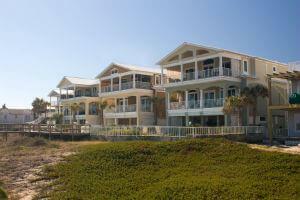 Multi-story homes provide a breathtaking view of the beach and the Atlantic Ocean. In addition to beach access, many homes also have hot tubs and heated pools for added comfort and indulgence. Coastal Living Magazine includes Rehoboth Beach in its top 10 list of the nation’s greatest boardwalks. One stroll down the boardwalk and you’ll know why. Flanked by top-quality restaurants and shops, the boardwalk offers an exciting beachside experience. Ice cream shops and other quaint local businesses make the boardwalk a popular day destination for visitors and locals alike. Living in Rehoboth Beach offers unique benefits for people of every age. Quality schools and family amenities such as water parks, access to State Parks, and more make the area great for families. Luxury amenities and activities such as fishing, boating, tennis courts, and more make Rehoboth Beach a popular destination for retirees as well. Quiet, friendly community with luxury waterfront properties. Close to Baywood Greens, a Championship 18-hole golf course. Quality locally owned shops and outlets nearby. Rehoboth Beach Bandstand offers unique performances and a free Summer Concert Series through mid-June to August. Haven for watersport enthusiasts such as kayaking, canoeing, stand-up paddle boarding, kite surfing, fishing, boating, and more. Numerous local parks such as Grove Park offer diverse outdoor recreation. Close to Cape Henlopen and Delaware Seashore State Parks. Whether you're an avid snowbird or looking for full-time residency, Rehoboth Beach real estate has a little something for every buyer and budget. Find out more about Rehoboth Beach Oceanfront homes for sale by getting in touch with the Mann & Sons team today! Send them a message or give them a call at 302.227.9477!